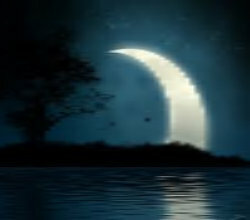 The Crescent Moon Rises(半个月亮爬上来,Ban Ge Yue Liang Pa Shang Lai,Folk song,民歌) was from Xin Jiang, China. The lyrics are about a suitor trying to get the attention of a girl from her window. The song was also compsed by Wang Luobin.